Dr. Bingsheng He is currently an Associate Professor at Department of Computer Science, National University of Singapore. Before joining NUS in May 2016, he held a research position in the System Research group of Microsoft Research Asia (2008-2010) and a faculty position in Nanyang Technological University, Singapore. He got the Bachelor degree in Shanghai Jiao Tong University (1999-2003), and the Ph.D. degree in Hong Kong University of Science & Technology (2003-2008). Bingsheng has served as a PC member for international conferences in databases (e.g.,ACM SIGMOD, VLDB, IEEE ICDE), cloud computing (e.g., ACM SoCC) and parallel and distributed systems (e.g., SC, HPDC and IPDPS), and as a demo co-Chair in VLDB 2017, PC co-Chair in IEEE CloudCom 2014/2015 , HardBD2016 and IEEE BigData Congress 2018. He has served in editor board of international journals, including IEEE Transactions on Cloud Computing (IEEE TCC), IEEE Transactions on Parallel and Distributed Systems (IEEE TPDS). His current research interests include Big data management systems (with special interests in cloud computing and emerging hardware systems), Parallel and distributed systems and Cloud Computing. His papers are published in prestigious international journals (such as ACM TODS and IEEE TKDE/TPDS/TC) and proceedings (such as ACM SIGMOD, VLDB/PVLDB, ACM/IEEE SuperComputing, ACM HPDC, and ACM SoCC). He is affiliated with both the Systems and Networking group and the Database group at NUS. He has been awarded with the IBM Ph.D. fellowship (2007-2008) and with NVIDIA Academic Partnership (2010-2011). He has got a number of paper awards and honorable mentions in international prestigious conferences and journals (see Awards). Xtra Computing Group is a tiny group of students and researchers in Singapore, who have been building various computing systems. Xtra's mission is to build faster, greener and cheaper high performance systems. OmniDB (2011-): Relational databases on emerging many-core architectures (including many-core CPUs, GPUs and APUs) Here are some highlights: a) OmniDB proposes a kernel-adapter based design, a portable yet efficient query processor on parallel CPU/GPU architectures [VLDB13Demo]. b) Two novel designs for taking advange of coupled CPU-GPU architectures (e.g., APUs) [VLDB2013] [VLDB2015]. c) GPL: a pipeline query execution engine [SIGMOD2016]. ReconfigDB (2013-): Hardware-software system design on OpenCL-based FPGAs The vision is to develop bionic parallel systems (e.g., database systems) with superb hardware speed (aka. bare-matal). To achieve this abitious goal, we need novel tools and systems. Example tools: we leverage static and dynamic analysis to develop an analytical performance model, which has captured the key architectural features of FPGA abstractions under OpenCL [HPCA16]. Example systems: databases [FPL2016], graph processing [ongoing]. more to add :) stay tuned. With the passion in system research, Bingsheng strongly believes in prototype implementation and empirical evaluation in addition to theoretical formalization and algorithmic design. As a result, his group and collaborators have developed a number of system prototypes (including Medusa, OmniDB, nanoCG, Mars and FD-tree) that are often requested and used by other researchers. Bingsheng has been growing into a multidisciplinary researcher with exposure to different cultures, research domains and collaborations. His principle is 80-20 rule (80% of his research time is devoted into his main research interests, and the remaining is spent on some radical/non-mainstream research directions). These are some examples of his radical/non-mainstream projects. Green systems through integration of renewable energy (2012-): We have developed the first green database system with the integration of solar panels, which is particularly attractive for Singapore [CIDR2013] [IC2E2016 Best Paper Runner Up]. Green In-Memory Computing (2011-): Main memory is a signiﬁcant energy consumer which may contribute to over 40% of the total system power, and will become more signiﬁcant for server machines with more main memory. We propose hardware and software co-design approaches to reduce the energy consumption of DRAM systems [SC2012] [TC2015] [TC2016]. Database Systems on Approximate Hardware (2014-): Recently, approximate hardware designs have got many research interests in the computer architecture community. The essential idea of approximate hardware is that the hardware components such as CPU, memory and storage can trade off the accuracy of results for increased performance, reduced energy consumption, or both. We propose a DBMS ApproxiDB with its design, implementation and optimization aware of the underlying approximate hardware. ApproxiDB will run on a hybrid machine consisting of both approximate hardware and precise hardware (i.e., the conventional hardware without sacrificing the accuracy). More details are in our vision paper [VLDB2014] and our study on sorting algorithm [SIGMOD2016-sort]. More code, papers and documentations can be found at Xtra group web site. Zeyi Wen^, Bingsheng He, Ramamohanarao Kotagiri, Shengliang Lu*, Jiashuai Shi*. Efficient Gradient Boosted Decision Tree Training on GPUs. IEEE IPDPS 2018: IEEE International Parallel & Distributed Processing Symposium. Zeyi Wen^, Xingyang Liu*, Hongjian Cao*, Bingsheng He. RTSI: An Index Structure for Multi-Modal Real-Time Search on Live Audio Streaming Services. ICDE 2018: IEEE International Conference on Data Engineering (ICDE), 2018 (industrial and application track). Zeke Wang^, Kai Zhang^, Haihang Zhou*, Bingsheng He. Hebe: An Order-obliviousness and High-performance Execution Scheme for Conjunctive Predicates. ICDE 2018: IEEE International Conference on Data Engineering (ICDE), 2018 (short paper). Kai Zhang^, Bingsheng He, Jiayu Hu, Zeke Wang^, Bei Hua, Jiayi Meng, and Lishan Yang. G-NET: Effective GPU Sharing in NFV Systems. USENIX NSDI: USENIX Symposium on Networked Systems Design and Implementation 2018. Amelie Chi Zhou*, Yifan Gong*, Bingsheng He and Jidong Zhai. Efficient Process Mapping in Geo-Distributed Cloud Data Centers. SC17: International Conference for High Performance Computing, Networking, Storage and Analysis 2017. Xuntao Cheng*, Bingsheng He, Xiaoli Du* and Chiew Tong Lau. A Study of Main-Memory Hash Joins on Many-core Processor: A Case with Intel Knights Landing Architecture. CIKM: ACM International Conference on Information and Knowledge Management 2017, Singapore (171/820=21%). I will give an invited talk “Data Management Systems on Future Hardware: Challenges and Opportunities.” in Joint Active and HardDB Workshops in ICDE 2017. Amelie Chi Zhou*, Shadi Ibrahim, Bingsheng He On Achieving Efficient Data Transfer for Graph Processing in Geo-Distributed Datacenters. ICDCS 2017: International Conference on Distributed Computing Systems (Experience and Application Track). Kai Zhang^, Jiayu Hu, Bingsheng He, Bei Hua. DIDO: Dynamic Pipelines for In-Memory Key-Value Stores on Coupled CPU-GPU Architectures. ICDE 2017: IEEE International Conference on Data Engineering (ICDE), 2017. Shuhao Zhang*, Bingsheng He, Daniel Dahlmeier, Chi Zhou and Thomas Heinze. Revisiting the Design of Data Stream Processing Systems on Multi-Core Processors . ICDE 2017: IEEE International Conference on Data Engineering (ICDE), 2017. Shuhao Zhang*, Hoang Tam Vo, Daniel Dahlmeier and Bingsheng He. Multi-Query Optimization for Complex Event Processing in SAP ESP. ICDE 2017: IEEE International Conference on Data Engineering (ICDE), 2017 (industrial track). 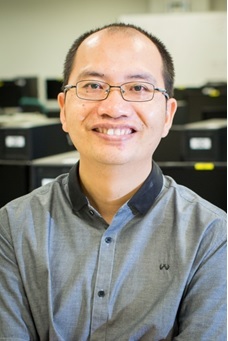 New Start: Bingsheng joined NUS School of Computing in May 2016.